State Sen. Adriano Espaillat (L) and Councilman Ydanis Rodriguez introduces Marisol Alcantara during official State Senate announcement on Thursday. INWOOD — With his handpicked successor officially in place to run for State Senate, State Sen. Adriano Espaillat is declaring this year's elections as "the year of the woman." Espaillat endorsed Marisol Alcantara, the Democratic district leader in Harlem, to succeed him in his 31st District seat as he runs to replace Rep. Charles Rangel. The state senator, who was joined at Tuesday's press conference by Councilman Ydanis Rodriguez, also endorsed Carmen De La Rosa, Rodriguez’s former chief of staff, who announced her run for State Assembly for the 72nd District in April. Espaillat, who is currently poised to become the first Dominican-American elected to Congress, was state senator for the past five years and prior to that was assemblyman for 13 years. There are currently no Latinas in the State Senate, Espaillat said. 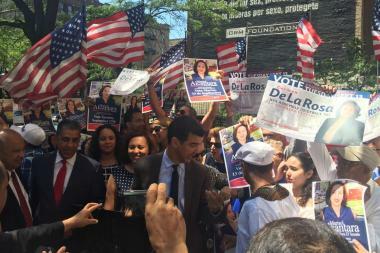 Speaking in Spanish, Espaillat said the community needs to back Alcantara and De La Rosa — citing their successful track records. “Alcantara is a fighter and very hard-working,” Rodriguez said, adding that she’s been dedicated for years to advancing the agenda of the working class and children, including leading his campaign run for City Council in 2001. “I want to continue do what I’ve always done — to be a champion for all of you,” Alcantara said, who said she’s worked for women and civil rights’ in the past alongside leaders like Rev. Al Sharpton and the Democratic District Leader in Harlem. Alcantara is currently running against Micah Lasher and Robert Jackson. Lasher previously worked as Eric Schneiderman’s chief of staff, and announced his candidacy in April with support from City Comptroller Scott Stringer, Assemblywoman Linda Rosenthal, Congressman Jerrold Nadler and Councilmembers Mark Levine and Corey Johnson. He had initially been endorsed by Rodriguez, but the councilman later backed out of his endorsement, saying that with the congressional race being over, the conditions were different. Jackson announced his run in February to get the fundraising started early and has already garnered the support of former Mayor David Dinkins, Sen. Bill Perkins, Assemblyman Keith Wright, Assemblyman Denny Farrell, Councilmember Inez Dickens, and several unions, his spokesman said. The primaries for the State Senate District 31 — which stretches along the West Side of Manhattan from Chelsea up to Washington Heights and Inwood to parts of The Bronx — is Sept. 13.